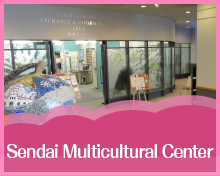 2019年4月13日 April issue of Sendai City Newsletter is now available online! 2019年3月29日 Open hours of the “Koryu Corner” will be changed from April 1st, 2019. 2019年3月18日 【March 25 – 31】We’re giving books away. 2019年3月10日 March issue of Sendai City Newsletter is now available online!